PRESS CORPORATION LIMITED (PCL) is pleased to announce the appointment of Dr George Partridge as the new Group Chief Executive. The appointment of Dr Partridge follows a rigorous and transparent recruitment process that commenced in January, 2016 and has spanned over a period of six (6) months. The Board embarked on a recruitment drive for a new Group Chief Executive in mid-2015 in light of the impending retirement of Dr Mathews Chikaonda in December 2016. To ensure objectivity and transparency, an independent audit firm, KPMG Advisory Services Limited (KPMG), was hired to handle the recruitment process, including the initial short-listing of qualified candidates; arranging for interviews and interfacing with the candidates. Notwithstanding the existence of a succession plan that the Board had endorsed, the process was open to internal as well as external candidates to the Group. The Interview Panel consisted of members of the Board’s Appointments and Remuneration Committee and representatives of KPMG. The Panel’s recommendation of the top three (3) candidates in rank order was deliberated upon and approved by the Board at its Special Meeting held on 17th May 2016. The Board expresses its gratitude to members of the Appointments and Remuneration Committee as well as the Partners at KPMG for their meticulous efforts in ensuring that the process was conducted in the most professional, efficient and confidential manner. Following three phases of interviews, Dr Partridge emerged the most suitable candidate whose credentials are well-aligned with the requirements of the job as outlined in the published Job Description. 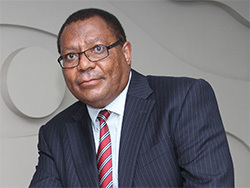 He is the current Chief Executive Officer of National Bank of Malawi, a key entity in the PCL Group. He is a holder of a Bachelor of Science (BSc) degree with distinction (majoring in economics with Computer Science as a minor) obtained in 1983 from the University of Malawi, Chancellor College. He also holds a Master of Science (MSc) degree (specializing in Finance) from the University of Southampton, UK; and, is a Chartered Accountant [(ACCA (1993), CPA (M) (1995) FCCA (1998))]. In recognition of his achievements and service to society, he was awarded an honorary Doctor of Philosophy (PhD) degree in Leadership and Management in 2016 by the University of Malawi. In addition, Dr Partridge holds various accolades and qualifications obtained from within and outside Malawi, in areas such as financial management; strategy; banking and finance; and management. The Board is convinced that in Dr Partridge, together with the rest of Executive Management, it has the right leadership team to continue to drive the Group’s agenda and strategy in the right direction and to lead the Group to greater heights. The Board also expresses its profound gratitude to the outgoing Group Chief Executive, Dr Mathews Chikaonda, who will be retiring after fourteen (14) years of committed and dedicated service to the Group. Under his astute leadership, the Group has made significant strides and registered enviable growth in revenues, profits, shareholder-value and asset base. The Board wishes Dr Mathews Chikaonda the very best during his retirement. To ensure smooth transition before Dr Chikaonda’s retirement, Dr Partridge’s appointment is with effect from 1st November 2016.